That was how the organisers described it. For good reason, as it was in fact 32.5 miles long (according to Memory Map, and the GPS I carried). They also very accurately described the event as 30 miles, barely qualifying as an ultra, but not to underestimate the tough course. Right on both counts, the course was tough. 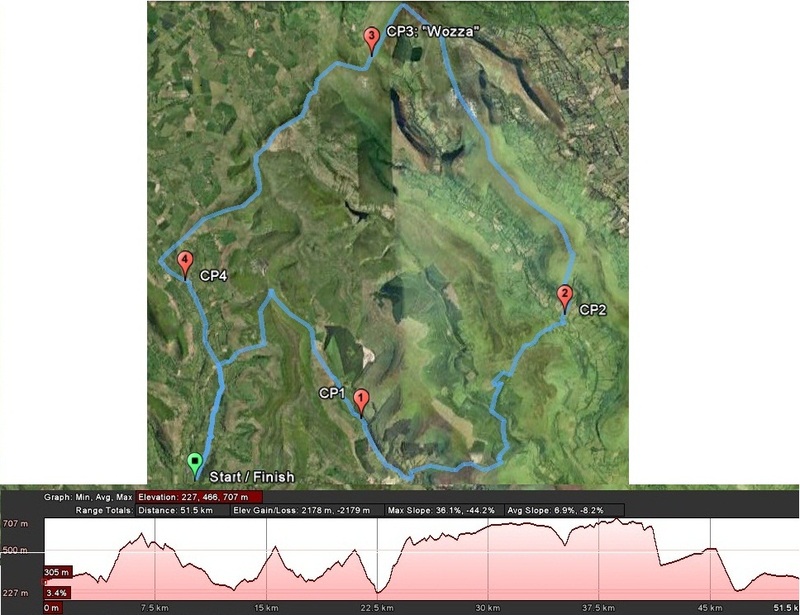 You can see the rough course and hill profile below, which included 2150M of ascent. I got up at 4:40am and drove down to Cwmdu, near Crickhowell. I arrived half an hour before the event started, and registered. We had a course briefing and roll call. A little over 100 starters if memory serves. We were told to watch hydration as it was a hot day. It transpired it’s been the hottest October day since records began, with temperatures reaching 29.9C in some parts of the UK. It’s more likely to have been around 23 or 24C for us, but it was hot enough. I decided to pack around 4kg of weight, which will be around half the fully loaded race weight for Nepal. I wasn’t looking to set any personal records, just put a lot of hills in my legs and get used to carrying a weighed pack on a longer event again for the first time in 18 months. The race started at 7:30am in the cool shade of the surrounding mountains. The first 2.5 miles were mostly on an undulating tarmac road before a sharp right turn off road and start of the first climb. Over the other side was a poor payoff as the descent was rubble strewn with deep ruts in the ground. At times as I was pleased that I had my fell shoes on, such as times like that, but for the parts of the course on tarmac, or the concrete slabs over moorland, I felt every step. At the base of that second major hill was a road crossing then another long slow climb through a forest and then up onto moorland. 3 or 4 guys came running past a few of us walking up the hill. I was pretty surprised to see anyone running up that gradient to be honest. It transpired they had been in the top 5 and got lost (doing an extra 3 miles I think), and were now playing catch up. Running up those hills must have really been punishing; I imagine almost no one ran those gradients. The run down the other side was down another narrow rubble strewn track for half a mile before a stile, and mile gradient through fields and down to CP2 at LLanthony abbey, at 14 miles. I refilled both bottles of water, knowing full well that the toughest climb of the day was the one that was looming directly overhead, the climb up onto Offas Dyke. I picked up the running again, trotting out a slow steady pace across the concrete slabs that cover the moorland, and sometime just easy running trail paths. This section was a very steady gradient uphill for 10km. Some of it I ran, other parts on the loose more rubble strewn ground I walk. I was feeling pretty tired already, testament to the lack of hills I’ve climbed this year. I wasn’t running nearly as much as I wanted to, but looking around, the people in the part of the field I was in looked to be in the same boat. We were all running everything flat, and walking everything that even resembled a hill. I’d gone from a 5mph average at CP1, to a 4.6MPH by CP2. Then just 1km later, up to Offas Dyke it had dropped to just 4mph average overall. That climb had totally killed my pace. The Offas Dyke part of the race was seemingly endless; that 6 mile pull over the moorland in the hottest part of the day was pretty tough. A couple of miles before CP3 I’d drank the last of my water, but I was well hydrated. I was feeling a little rough, and knew I needed to take stock at CP3. Took this just before the descent to CP3, and that hill in the distance was the one immediately after the CP. I ran down off the hill to CP3 at 22.4 miles and the next water stop. I took 5 minutes to sit down, refill my bottles, eat a couple of fast sugar energy sweets to whip me into action and cracked open a packet of Marmite cashew nuts. I’d already eaten 3 granola bars and 2 packs of crisps, so I was ripping through my calories. I set off from CP3 up yet another climb, though much less steep, whilst eating half the pack of cashews. Even as the gradient eased off to give way to steady open moorland I wasn't feeling that great. Those nuts would take a little longer to hit me, that the sweets, but the energy would also last longer; well that’s the theory. The next 5k was still overall ascent, and it was only as I was half a mile off the highest point when I got my second wind, around 25 miles. I suddenly felt pretty good again, and hoped I could pull back some time on the last 7 miles to bring the current 3.9mph average back up. I caught up to one of the guys who had ran past me, who had been in the top 5. Clearly a very good runner, but the effort to try and pull back the race had eventually hit him. We ran down to the last CP at 28 miles together. There were a few snacks to eat here, but I was feeling well fed at this stage, and headed out fairly quickly up the last short but stiff climb of the day. The other guy descended much quicker than my aching quads were willing to allow, and after hearing he was in around 53rd place, he wanted to see if he could get into the top 50. You know I think he may well have managed it, since I passed a couple more people a mile or so later with about 2.5 miles left to go. The last few miles were a combination of muddy trail and then the last 2.5 mile on tarmac. I ran the vast majority of it, but still walked up the steeper gradients. I was feeling pretty tired, and was suffering some pretty horrible indigestion/acid, making me feel very uncomfortable. I was happy enough to see the finish, and crossed the line in about 7hrs and 52 I think, about 4.1mpg. I’d pulled back the average a little, but it still felt fairly slow. I’d walked a lot more than I usually do in an ultra. The hills of course were the killer, and it’s what I asked for after all! I only consoled myself with the thought that I was about 50% of the way down the field, and there was another 50% still struggling. I may not be as fit as I was before the groin surgery, but I should be happy with the finish, when I factor in the hills and the half Nepal race-weight rucksack. The finish was nice, with everyone clapping others runners in. The organisers were welcoming, and provided a souvenir mug and medal. I hadn’t needed to use the supplied map all day, the route marking was so good. The CP volunteers were all very encouraging, and the event went off without a hitch as far as I could tell, so well done to the organisers. I couldn’t hang around for the prize giving, as I had a long drive home. I think I finished around 50th, but the results aren’t up yet. I’m not sure what the general consensus of the difficulty was or how many people dropped out, but I thought it was pretty tough. Next weeks event, is a 20 mile event in the same area. 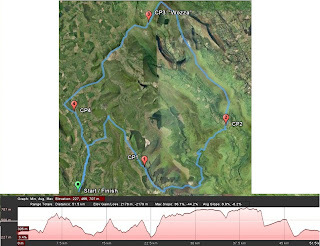 The Talybont Trial has 1500M of ascent in 20 miles. It should be a walk in the park by comparison, but given that navigation skills will be required and it’s highly likely the weather will be the total opposite, I fully expect it to be almost as tough. Rich, this is really rather good. You've completed a tough Ultra, perhaps in a slightly slower time than you might have done a couple of years ago but that's entirely to be expected, yet there was no mention of niggle or injury. I am dead chuffed for you. If you continue to be careful while plugging away, things can only improve. Keep strong for Nepal. Thanks Nick, I had no groin niggles at all. The effort of the distance and hills alone is what was hurting, which is a good thing in the grand scheme of things!